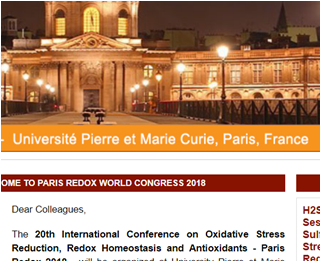 AOP will be present at the antioxidant international congress (2018 Redox World Congress) that will take place in Paris, France (June 25 & 26) at the Université Pierre et Marie Curie (Sorbonne University). This 20th conference organized by the ISANH (International Society of Antioxidant in Nutrition and Health) will welcome the academic and industrial community on different topics such as the oxidative stress, the homeostasis and the antioxidants. This congress will give the opportunity to AOP to present its technologies and position its new LUCS assay on the nutrition and health domains.